PraziPond Plus Praziquantel (“Prazi”) is the preeminent treatment for flukes. ‘Prazi’ is by far the most gentle, yet effective treatment for flukes available to our hobby. The real bonus with ‘Prazi’ is that when you treat for flukes it also rids the fish of any internal parasites or worms. ‘Prazi’ is extremely effective for the treatment of external flukes, liver flukes, internal parasites and internal worms in koi, goldfish and tropical fish. ‘Prazi’ is a one time treatment and because it is so gentle, it does NOT require any water changes after treatment and you do NOT need to bypass your biofilter. Prazi also will work with any amount of salt in the pond and it is not water temperature dependant. PraziPond Plus is USP grade (99.5% pure) prazi blended with cyanocobalamin and a proprietary polymer mixture. No other prazi available today has this advanced formula. PraziPond Plus is 40% more effective than prazi alone. Small 10 gram bottle treats 1,000 gallons. Large 50 gram bottle treats 5,000 gallons. Caution: The only accurate way to measure Prazi Pond Plus for dosing is by weight. Measuring Prazi Pond Plus, assuming a tablespoon is equivalent to 2.9 grams is not accurate. Due to settling of the product in shipping and when scooping it out ofthe jar, 1tablespoon could contain as much as 7 or 8 grams of Prazi Pond Plus. Only one treatment is needed and no water changes are required after the 7 day treatment period. During the 7 day treatment do not do any water changes. Water can be added to the pond during the treatment period as needed due to evaporation, etc. Turn off uv lights for alleasl 4 days al start of trealment period. Dissolving Prazi in water: Prazi does nol dissolve easily in water. There are various methods for applying Prazi to your pond. First of all please note that you do NOT need to achieve a 100% dissolving rate when mixing Prazi with water. Prazi will totally dissolve in your pond over a short period of time after application. 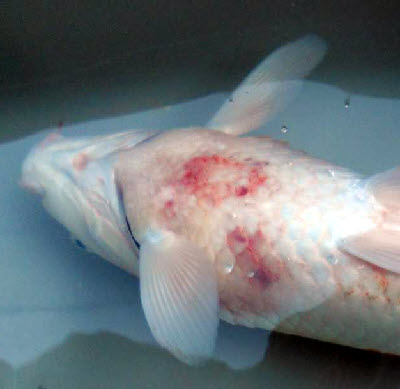 When applying Prazi to your pond while it is only partially dissolved is not dangerous to your fish even if they eat the Prazi flakes in the water. Prazi is NOT harmful to your biofilter. Prazi treatments are effective at ANY water temperature.